The resistance to breathing due to anaesthetic apparatus has been a cause of concern to anaesthetists for nearly a century. 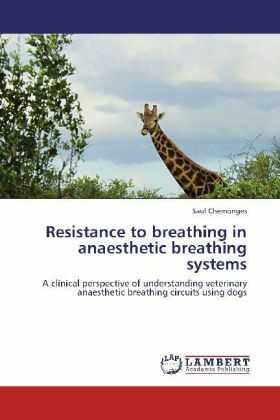 This book presents material that was gathered in a clinical experimental setting and quantifies the resistance to breathing in anaesthetised dogs connected to the commonly used anaesthetic breathing systems. Chapter 1 introduces the subject of resistance to breathing in anaesthetic systems. Chapter 2 reviews the relevant literature regarding anaesthetic systems. Chapter 3 explores clinical investigative methodology of resistance to breathing in anaesthetic systems. Chapter 4 outlines the clinical observations and Chapter 5 presents a discussion of the observations and conclusions. The book provides an avenue to disseminate valuable information and the understanding on how anaesthetic breathing systems work in a simple and concise manner. It also presents and discusses results comparing two types of vaporiser configurations, two types of carbon dioxide circle absorbers, and two pop-off valves commonly used in small animal anaesthesia. Veterinary clinicians, students, technicians and lecturers will find this book invaluable.